King Sargon's Float is Mule Drawn . Traditional Flambeau. The Krewe of Babylon, is the Carnival's most interesting Krewe when it comes to this schedule. In some future years this Krewe will probably become one of the future Super Krewes because of it's very make up. It consists of prominent business men and women from around the country. Founded in 1939 the group has consistently turned in some of the best parades for over sixty years. At last count the group had 250 members or Knights and was still growing. Babylon was an very important city located on the Euphrates River in southwest Asia, several centuries ago. The Mardi Gras krewe bearing it's name was founded in 1939 in New Orleans. The men called knights, also call their reigning monarch Sargon-just like the king who was the legendary monarch of the ancient Semitic races. True to Carnival and Masonic tradition, from which a fair number of these gentlemen come, they are very secretive in nature. Since it means a great deal to the Knights the identity if their king is never released to the general public. The exact title of Babylon's elaborate parade and ball theme are also undisclosed until the day of the event. Customarily, each float depicts a chapter in a continuing story, usually historical, classical or literary in theme. The Jester's Club, the sponsoring organization of the Knights of Babylon, was founded on June 24, 1939 by a group of New Orleans professionals who wanted to stage a first-class Parade for the public and a first class Tableau Ball for their ladies. They continue to adhere to that tradition. Babylon has always received the highest praise, particularly for doing it the “right way.” Their floats are the same design they were 70 years ago and still have the traditional flambeaux with the King’s Float being mule drawn. Unlike many other organizations, they own all of their floats and own the den where the floats are housed. The parade travels the traditional New Orleans route down St. Charles Avenue. the krewes traditional Tableau Ball has been staged at the Municipal Auditorium since the inception of the Organization. However, due to hurricane damage sustained by the Auditorium in August 2005, they moved the ball and supper dance to the Sheraton Hotel on Canal Street where it remains today. 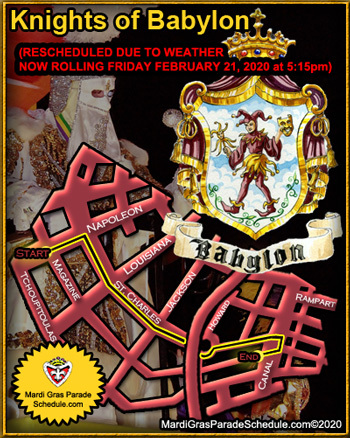 Since its inception, Babylon was held on the Wednesday before Mardi Gras. However, the Krewe of Momus, who traditionally paraded on Thursday stopped parading in 1992 and as a result, in 1993, Babylon moved its parade and tableaux ball to Thursday before Mardi Gras. Babylon, the Capital of Babylonia was an important city of ancient Mesopotami, the ruins of which can be found in present-day Iraq. Babylon became one of the most important cities of the ancient Middle East when Hammurabi (1792-1750 BC) made it the capital of his kingdom of Babylonia. All that remains today of the ancient famed city of Babylon is a mound, of broken mud-brick buildings and debris in the fertile Mesopotamian plain between the Tigris and Euphrates rivers, in Iraq. Babylon, its namesake Mardi Gras organization was founded in 1939 by a group of men who wanted to stage a first class parade for the public and a first class tableau ball for their ladies. Originally known as the Jesters Club, the Knights of Babylon continues to adhere to the tradition of its founding members. Babylon’s monarch, Sargon, king of Assyria (722–705 b.c.) who is said to have build the city of Babylon, reigns over the parade and ball. Secrecy is of great significance to this Krewe and this is why Sargon’s identity is never revealed to the public as well as the theme is kept secret until parade day.